Last month, the Census Bureau released its latest data on wealth, updating earlier figures from 2005 to 2010. The numbers confirm findings from a Federal Reserve Board survey showing unprecedented declines in the net worth of the typical American household. The Census figures indicate a drop of 35 percent between 2005 and 2010 in median wealth-the wealth of the household right in the middle-from $103,000 to $67,000. The estimates from the Federal Reserve show a decline of 28 percent between 2004 and 2010. From 2007 to 2010, median net worth declined by an astonishing 39 percent in three years. This loss of wealth surely hurt many people counting on these funds to pay for retirement, children’s schooling, and other needs. Others counted on being able to sell their homes to take advantage of opportunities in other parts of the country but are now underwater on their mortgage and stuck in place. Viewed in context, however, the wealth levels of middle-class Americans are in better shape than these dramatic figures would suggest, though they have not improved markedly over several decades. In some sense the recent drop in wealth is a mirage, because it reflects the reversal of wealth increases that themselves were illusory. For the vast majority of families, “wealth” essentially means, “home equity”. And the relatively high wealth levels of the mid-2000s reflected the inflation of the housing bubble. The bursting of the bubble exposed the wealth gains as having been unreal and produced the sizable declines in net worth revealed in the government data. How illusory were the earlier wealth gains? In 1998, home prices were right in line with the cost of rental housing by historical standards. By early 2006, they had increased 70 to 90 percent more than rents had. Correspondingly, median non-financial assets increased 41 percent from 1998 to 2007, while median financial assets rose just 1 percent. 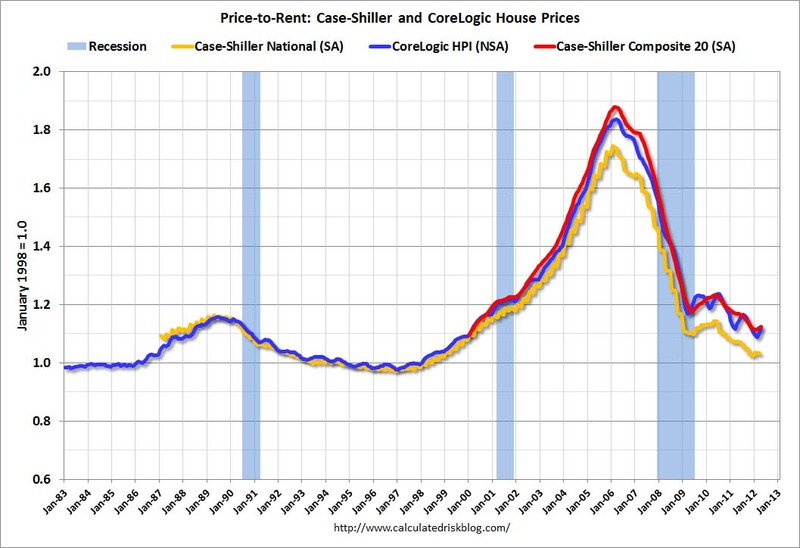 Only now are home prices approaching the historical norm again relative to rents. The survey data allows us to compare 2010 to 1998 to evaluate what has happened to net worth if we ignore the inflation and deflation of the housing bubble. Median wealth fell by 19 percent over this period according to the Federal Reserve Board numbers, but was essentially unchanged if the Census Bureau figures are to be believed. Indeed, the Census Bureau estimates suggest that median wealth was roughly the same in 2010 and 1998 as in 1988 and 1984. The Fed survey also indicates that 2010 wealth levels were the same as in 1989. Obviously it is disappointing that the wealth of the typical household is no higher today than it was a quarter-century ago. Still, median wealth is probably higher today than it was forty years ago. Estimates from the Fed’s earlier surveys from 1962 and 1983 are not comparable to the surveys since 1989, but the increase in wealth between the two years was about as robust for the median household as for the average. That fact is useful because macroeconomic data compiled by the Fed can tell us what happened to average wealth over the long run. From 1970 to 1984, it rose by about 15 percent in inflation-adjusted terms. If median wealth rose by the same amount and then remained the same in 2010 as in 1984, then median net worth today remains 15 percent higher than its 1970 level. It is worth not losing sight of the fact that we are wealthier today, in the wake of a catastrophic collapse in housing markets, than at the height of the “golden years” of post-war economic growth. The magnitude of short-term declines cannot be the sole criteria by which we judge how we are doing. The typical household in the top ten percent of wealth saw its net worth decline by $450,000 between 2007 and 2009, while the typical household in the bottom quarter saw no decline in wealth. We don’t worry much about the massive wealth decline of the top ten percent because the median household in that rarified club was still worth well over a million dollars in 2009; conversely, we worry about the bottom quarter despite the recession not affecting its wealth because the median there was under $2,000 even in 2007. In an important sense, it is the levels of wealth that matter, at least as much as whether wealth has fallen or increased. With this in mind, another consideration that ought to affect how we view wealth levels is the fact that none of the figures above include public and private commitments that most Americans can count on to meet their needs in old age. Research by Federal Reserve Board economists suggests that if the present value of Social Security benefits were included in the definition of wealth, median net worth for adults under age 65 in 2010 would be at least four times higher than indicated by the standard definitions of net worth used by the Census Bureau and the Fed. And this adjustment would still exclude the value that future Medicare benefits will have for most retirees, as well as the value of traditional pensions and retiree health benefits provided by employers. Finally, it is also worth noting that changes in the median household’s wealth do not necessarily reflect the median change in wealth experienced by households. That’s because the median household—the one in the middle—is not the same in any two years. From 2007 to 2009, while median wealth declined by 39 percent, the median change in wealth experienced by households followed over the two years was a decline of 18 percent. Over a longer stretch such as 1984 to 2010, even if median wealth is stagnant, most people will experience wealth gains as they age. None of this context suggests that the last few years—or the last couple of decades—have seen sizable improvements in the wealth levels of the middle class. But over the long run, things are not getting worse. Evaluating whether the similarity of wealth levels over several decades is problematic and would require a better understanding of changes in saving patterns and their causes. What matters is whether middle-class Americans are no better positioned to save today than in the past or whether they increasingly choose to consume goods and services rather than save.